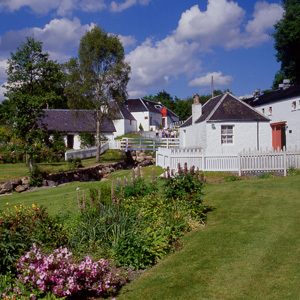 Edradour Distillery is the home of Edradour Whisky, a single malt Highland whisky made in Pitlochry, Perthshire. The distillery is said to be the smallest in Scotland, making it a rather fascinating place to visit. A tour of the establishment costs only £5. Established in 1825, Edradour Distillery was originally run by a trio of men, but today the job is done by two. The small yet productive distillery produces only twelve casks per week, using the smallest stills of any working distillery in Scotland. By law, if they were any smaller they would be classified as portable stills, which are often associated with illegal alcohol production. The whiskey is matured for at least ten years before the distillery deems it of a high enough quality to be released onto the market. There's a variety of whiskeys available from the Edradour Distillery, most of them chill-filtered in a process where the esters and oils are removed, which gives the whiskey a somewhat cleaner look and prevents the whiskey from turning cloudy when chilled by ice. There is also a non-chilled twelve year malt which is used in the “House of Lords” and Clan Campbell” blends. Because the Edradour Distillery has a very limited production rate, it can prove a bit of a treasure hunt trying to find their whiskey in the shops. The only place you are sure to find the whiskey is at the Edradour Distillery itself. For this reason it is well worth a visit to the distillery if you are in the highlands region. As mentioned before there are tours available, so visiting the distillery can be made into a day out when having a holiday or short visit to Pitlochry or other nearby Highland towns. Many visitors rate this outing as one of the top activities on a list of things to do in Pitlochry.